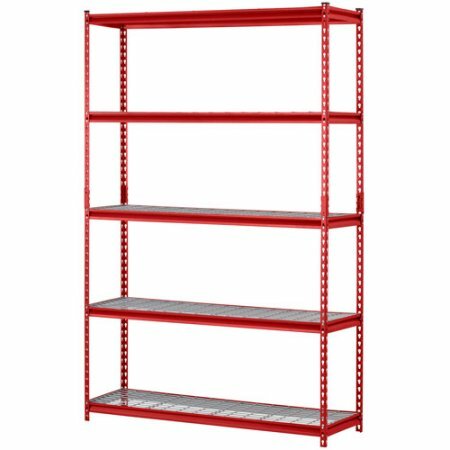 If you need a heavy duty shelving unit, you may have considered Muscle Rack. They’re very popular online, and reviews are very positive. But how do they actually stack up? 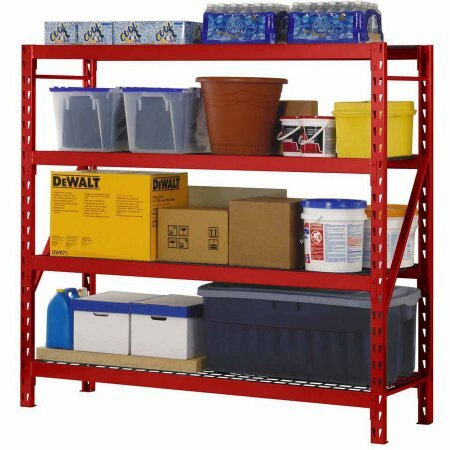 In this review we’ll outline all the benefits and drawbacks of this shelving unit so you can decide if it’s going to be worth your hard-earned money. Don’t have time to read the full review? Use our quick synopsis to make a quick decision! 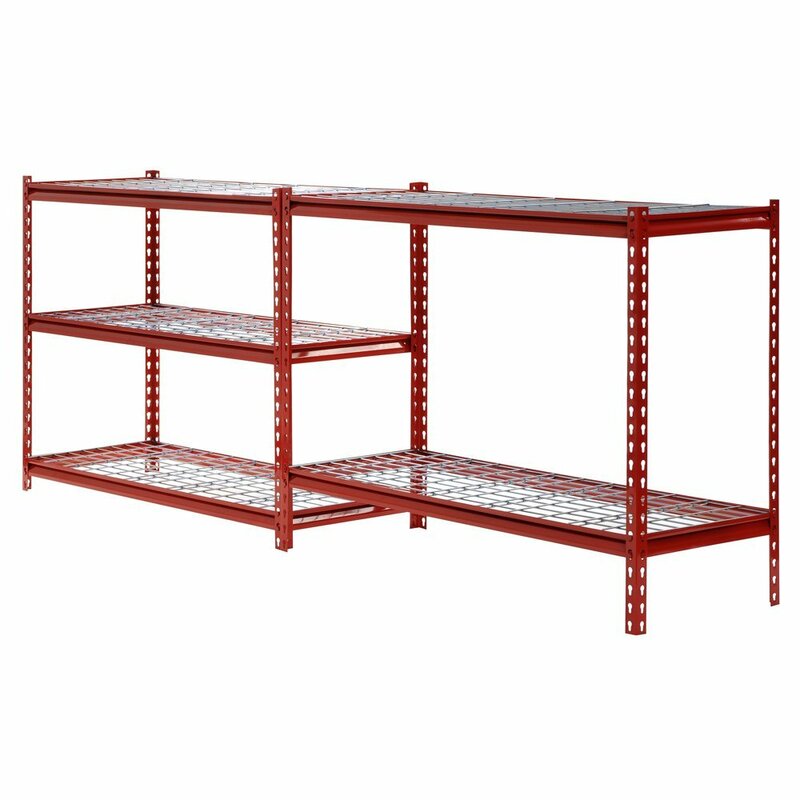 With a name like Muscle Rack, you expect this heavy duty shelving unit to be strong and durable. Thankfully, it holds up to its namesake. Each unit is manufactured from industrial strength steel providing strength and rigidity. Sure, it’s a little on the heavy side at about 50lbs, but that’s the price you’re going to pay for such heavy duty steel construction. 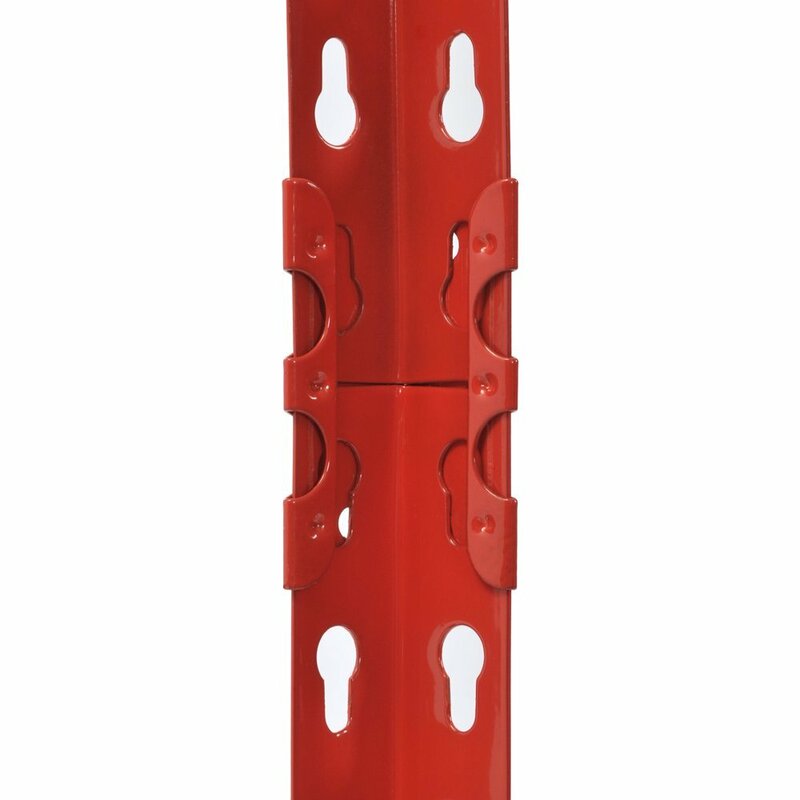 Because steel is subject to rusting, these units are coated in a bright red paint to avoid corrosion. Not only does the paint function to protect from rust, but it looks great in a shop, garage or workplace. The pain is fairly thick, but if you’re not careful with certain tools around it or taking them off the shelf, it can be subject to chipping. It’s not like this small amount of rust that would result will get even close to the point of affecting the structural integrity of the unit, but it can be a bit of an eyesore. 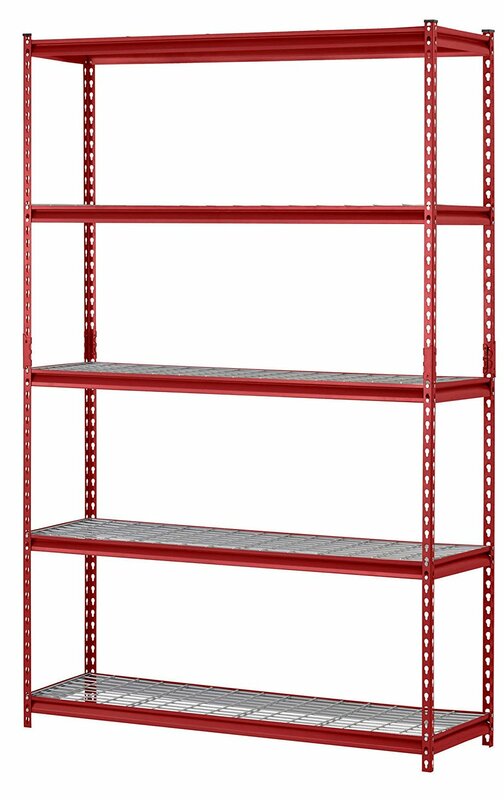 The steel wire shelves bases are very strong and each shelf can hold up to 800lbs of evenly distributed weight. If you stick something a few hundred pounds directly in the center of one of the shelves, you may experience some sagging over time. But, for most uses you should never see any sort of sag because the wires are thick and strong. 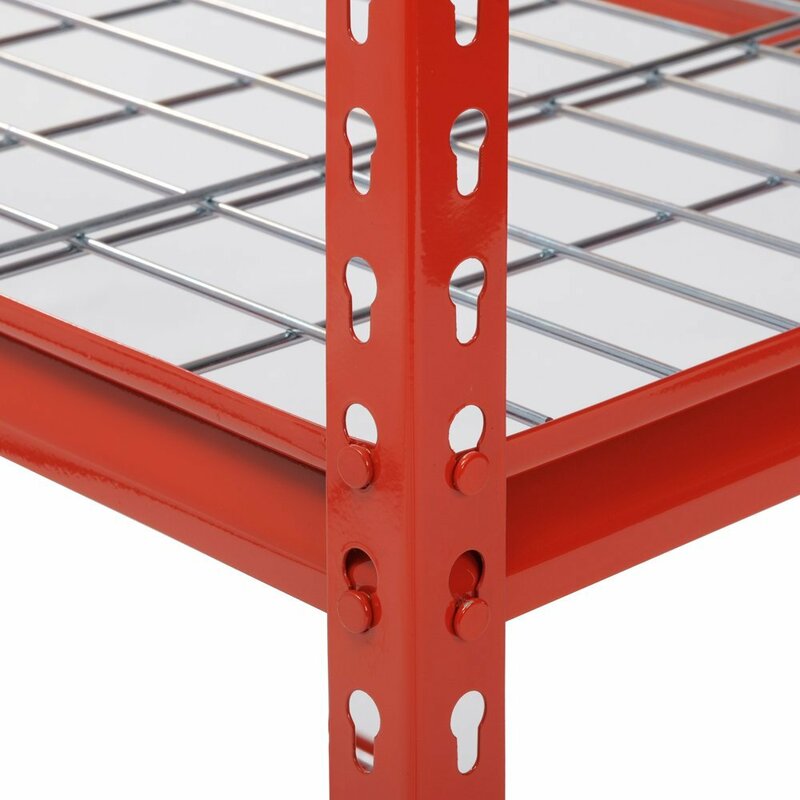 While it may look like this would be an issue due to the lack of any sort of cross beam under the shelf, the mesh wire design distributes the weight equally to the vertical posts. Unfortunately, one feature that we are disappointed to see missing is that there are no L-shaped rubber feet to mount on the bottom of the vertical posts. If you’re putting the shelves in your garage on a surface you don’t care about it’s no big deal. But in some workspaces you may care more about the surface and should lay down some cardboard, rubber or wood to save the floor from any scratches. Don’t let the few negative reviews on Amazon scare you away – it’s not actually that difficult to assemble. Most of the people leaving these reviews probably can’t put together a lego set. As long as you follow the instructions, you shouldn’t have any issues. It can be a little difficult to get the first shelf together if you’re doing it alone, but after that it gets easier as you work your way up. You should absolutely make sure you get a rubber mallet because this shelf doesn’t need any screws or bolts. Each component fits snugly into place without anything like that. Not needing any hardware is great since you can’t lose anything or need the right screwdriver or wrench to assemble/disassemble it. Using a rubber mallet is the way to go since you don’t have to worry about chipping or denting anything. The best way to assemble is to make the first shelf into two “L’s” using 2 uprights, one short end piece, and one long bar. You should have the front and back of the first shelf that you can then combine. From there it’s pretty straightforward as you work your way up following the instructions. You should consider measuring whatever you may be storing on the shelves before assembling so you avoid adjusting the shelves after it’s assembled. Use a piece of wire or zip tie to mark the notch you will mount the shelves on to remember. A Muscle Rack unit can be a perfect storage solution for so many different places and situations. It’s perfect for the garage, to store tools, garden supplies, beach gear and more. It’s also great for sheds and even if your shed is a little smaller, you have the option to use it vertically with 5 shelves high, or horizontally with 3 and 2 shelves. They’re a great affordable option for small business as well, being sturdy enough for even heavier supplies like printers and paper, and the wire shelves are great to keep electronic wires tidy. Whatever space you need the storage, this heavy duty unit will have you covered. Overall, we love the Muscle Rack shelving unit. It’s a heavy duty solution for many different spaces: your workshop, garage, warehouse or shed. 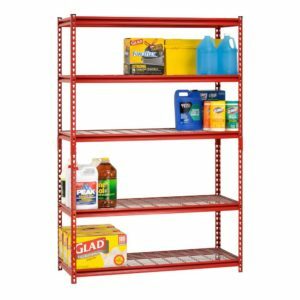 This steel unit is strong and durable, and the shelves can hold a ton of weight without fear of them ever bending or sagging. The bright red paint looks great and protects the inner steel components from rust. However, it can chip off if you’re not careful so you’ll need to take care in certain instances. It’s a very versatile unit, as you can mount it with all 5 shelves vertically like a bookshelf, or split them up horizontally like a dresser. Whatever space you have available you can make it fit. Don’t let the reviews online scare you away – the assembly isn’t really that difficult. You don’t need any hardware like screws or bolts, it all latches and pops into place with a unique locking mechanism. The first shelf can be a bit difficult to get put together if you’re doing it solo, but after that it’s not bad. You should definitely pick up a rubber mallet though – it’ll save you time and energy, and won’t damage the shelving unit. Overall for the money, we love Muscle Rack and it’s a great option for most folk.